Kingsbarns Golf Links is looking forward to the New Year after finishing 2012 as it started: by winning a prestigious award. A successful season for the East Neuk of Fife links was completed in style when it was named the Course of the Year at the renowned Golf Tourism Scotland awards for the second year in succession. 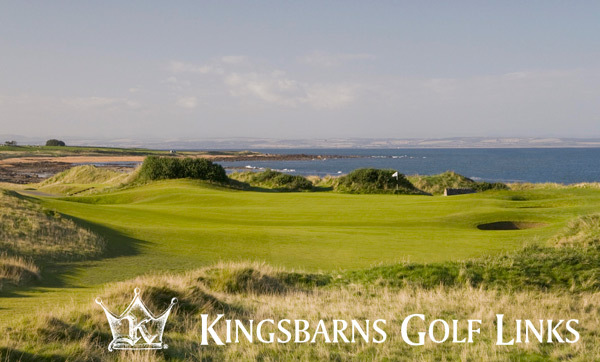 It was the fifth time Kingsbarns has won the award in only its twelfth year of operation. The award follows on from Kingsbarns being ranked the Number One Modern Course (built after 1960) in Great Britain and Ireland by the respected American magazine Golf Week for the third consecutive time at the start of the season. The welcome recognition was achieved at the same time as Kingsbarns continued to perform well despite the challenging economic situation. More than 25,000 rounds were played at the modern links between March and November and the course continues to receive excellent feedback from golfers for its emphasis on delivering outstanding customer service. Three innovative new programmes were implemented as part of Kingsbarns’ customer service strategy in the 2012 season. A “Cheerio Concierge” was introduced to assist golfers when they complete the round to ensure they benefit from the services and facilities on offer in the clubhouse. A new improved caddie programme was introduced by the Caddie Master Sean Wiseman. Kingsbarns is supporting the caddie experience fully by guaranteeing that if the customer does not believe his caddie to have enhanced his round on the Links, he will receive a full refund. Finally, golfers can warm up from grass tees giving them the true links feel (except on bad weather days). Alan Hogg, Chief Executive of Kingsbarns, said: “This has been my first full year in charge at Kingsbarns and I believe we have made great progress in a short period of time. It is gratifying to receive two such prestigious awards and is welcome recognition for the hard work and dedication shown by the team here toward delivering an outstanding experience for golfers. Kingsbarns carried on with its work for charity this year with around 40 different worthy causes benefiting from its support. The highlight was a special golf day in September hosted by former Ryder Cup Captain Colin Montgomerie which raised around £40,000 for the Elizabeth Montgomerie Foundation. The Foundation, named after his mother who died from cancer, is currently working to raise £4 million for two new Maggie’s Cancer Caring Centres in Scotland. Bookings are now being taken for 2013. The green fee prices remain frozen at £175.00 from 23 March through 30 April 2013 and at £195.00 from 1 May – November 2013. To book a tee time please contact + 44 (0) 1334 460860 or info@kingsbarns.com. Located just seven miles south-east of the Home of Golf at St Andrews Kingsbarns is a must-play seaside links course which regularly features in top 100 golf courses rankings in the world. Designed by Kyle Phillips, the golf course opened in 2000 and is set on land which gently slopes down towards the coastline, so nearly every hole boasts spectacular views of the sea. At 7,181 yards from the championship tees, Kingsbarns is a formidable enough test to be included in the Alfred Dunhill Links Championship rota each autumn alongside the Old Course at St Andrews and Carnoustie Golf Links. Kingsbarns prides itself in excellent customer service and great accessibility for tee times. Visitors are treated as members for the day and enjoy assistance from the moment they step out of their car until they leave. Kingsbarns Golf Links has been selected to host the Final Qualifying for the 2013 Ricoh Women’s British Open on Monday, 29th July 2013, ahead of the Championship proper which will be played for the second time over the Old Course, St Andrews, 1st – 4th August. Kingsbarns Golf Links is ranked amongst the top 100 courses in the world and, located just seven miles from the Old Course, provides the perfect stage for the curtain raiser to the 2013 Championship where the world’s best women will seek to show their links skills in the most famous corner of the golfing world. Nestled in the foothills of the Atlas Mountains against a stunning scenic backdrop, the Al Maaden Golf Resort was designed by Kyle Phillips and opened at the beginning of 2010. We caught up with Mr Phillips, a member of the American Society of Golf Course Architects (ASGCA), ahead of the Lalla Aicha Tour School to discuss his first golf course design project in Morocco. Mr. Phillips, you have 25 years of experience in the golf course design industry. Can you start by telling us which courses you designed prior to Al Maaden? Kingsbarns in Scotland: it opened in 2000 and it immediately went to top 50 in the world. It was the venue of the Dunhill Cup. Other courses that the Moroccans are also probably familiar with would be Yas Linksin Abu Dhabi, which is also in the top 100 and opened a couple of years ago. Every magazine and publication has it as number one in the UAE. Those are a couple of golf courses that people would know. And then, The Grove in London is a course that hosted the World Championship that I designed. You are American, so when did you start to design golf courses in Europe? Very early in my career. I worked with Robert Trent Jones Junior in his offices in California in 1991 and as Mr. Trent Jones senior got older, we were working in Asia and mainly in the west and he was working in the east, in Europe. So, as he got older, we started crossing over. I was appointed in 1998 to be the architect for the Robert Trent Jones Golf Club, in Washington DC. This golf course, which opened in 1991, was the first venue for the President’s Cup. Then they had several tournaments, so I have been working with that club since 1998, but in that time, there were some changes they wanted to be made, so it was nice to be able to go and see him and present my ideas and talk to him about them and you know, to know that he was enthusiastic. It was nice to be the person that was selected to continue to on with the Jones’s legacy. Even today if you go there and see the course, you won’t differentiate between what’s new and what has been changed and this is one of the things that I really pride myself on. Renovation work is to make the architecture look similar to what there was before. It‘s not like I impose my design on your design. I try to keep the same flavour and the same beauty and style. Since you have been working with Robert Trent Jones’ company… Do you think your courses have a Robert Trent Jones’ feel or some influence of this style in designing? One of the motivations for starting my own firm was to do different styles of architecture. I mean I enjoyed what we did and it was good but I really enjoy architecture in general, so, I know many people in fact that come to Al Maaden and then they say, ‘This looks like nothing you have ever designed… this is very different.’ Some of the principles of architecture are the same that I employed my philosophy about to the greens and strategy. I think this course is really good. I have received very good feedback from players of all skill levels that they find it’s enjoyable and as a resort, this is what it is meant to be. When you design resort courses, you have to try to make the people happy to come here to play, so they have an enjoyable day and here you have to try to make them feel like they are on a Moroccan kind-of garden setting. This was the idea of the landscape on this course. How many golf courses have you designed approximately around the world? Well, I do not know the exact number but around 50. I really have a passion for design, so I tend to really be into my practice. For me, if I can keep a couple of courses under construction every year, it would be ideal, and fortunately, I am able to do that. Let’s talk about this course Al Maaden… When did you start this project? We had the first meeting in 2006. We came here to do some planning. At that time, they already had the master plan here done. So, the general configuration of the course was here. In this master plan, they had an island of houses in the middle of the back nine so I was able to take out the island and reconfigure the golf a bit. The terrain was literally flat; it had a slope from the top and slope to the bottom but almost like a table with a little slope. All of the landscaping and all of the features, everything: as you look around of this area, you know what it is like, it looks like a desert, with very little vegetation. So the idea was to create like a Moroccan garden. Because when you come here, you don’t come just to play golf, but to enjoy the day. Many people that are not playing professionally, they are for a beautiful walk, a nice relaxing time and they want to experience the place. The lakes, for example were designed by Fernando Caruncho, from Madrid, the landscape designer, which I thought it was a great idea. What makes this course different from your other courses you have designed? The style and the lakes, it’s very unique. The lakes were not at the beginning of the plan and then the lakes were brought in to reflect the style of landscape that Caruncho wanted to have here with these long reflecting pools and water stepping down and all of that. How would you define this golf course? The idea of the landscape is like a typical Moroccan garden. The strategy is that it’s for typical everyday player, a tourist and a resort-type level player. We can also bring the professional here, and put them on back tees. Whose idea was to add those four modern art sculptures to the course? This was the owner’s idea. So, there are mixed styles. How it’s decorated, with a landscape or like with the art, it can take a whole different feeling although the principles of the architecture are the same. It’s Moroccan style with a modern touch. So, I think even some modern art on that, as long as it is not imposed, it’s nice to have.Golf is much more than shooting a score. Golf is a walk with your friends. This is a very walk-able course. How many projects are you working at the moment? We have just finished a course in Korea and we have a second course in Morocco, Agadir, nearby the Ocean. 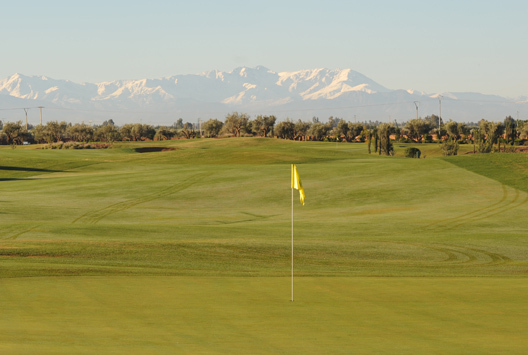 Then, we are designing another course in Marrakech, towards the Atlas Mountains, so it has a stronger view of the mountains, but it will be completely different from this one. We are working on a private one in the south of France. In Spain, we rebuilt the tees, the greens and the bunkers at “Las Brisas” and we are planning another 9 hole-course in Madrid called “Puerta de Hierro”. Also there is another in California, right in the Silicon Valley.